Dillashaw, an avid juicer and organic food advocate, recently agreed to a multi-unit Franchise Agreement that will bring additional stores to the California and Colorado markets under his ownership. 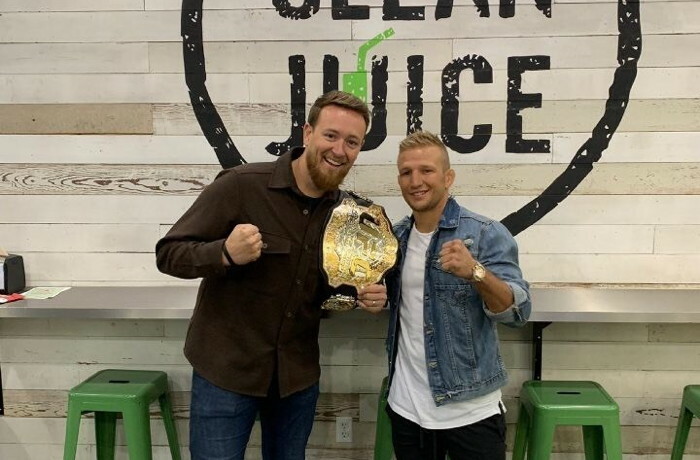 Clean Juice announced yesterday a multi-unit agreement with its newest Franchise Partner, Tyler Jeffrey (T.J.) Dillashaw, a mixed martial artist currently signed with the Ultimate Fighting Championship (UFC). This Saturday, Dillashaw is scheduled to fight Henry Cejudo for the Flyweight title bout at UFC Fight Night 143 in Brooklyn, NY where he could become the fourth "champ-champ" in UFC history. Dillashaw, an avid juicer and organic food advocate, recently agreed to a multi-unit Franchise Agreement that will bring additional stores to the California and Colorado markets under his ownership. Dillashaw is known to many as a fervent consumer, maker and evangelist of cold-pressed juices, smoothies and other organic foods. "Having T.J. become a part of our family is not only exciting for all of our franchise partners and our employees, but also for me personally," said Landon Eckles, co-founder and chief executive officer of Clean Juice. "Even before I knew he was a juice connoisseur, I was a big fan of his because of his relentless pursuit of excellence, his meticulous attention and commitment to detail and his overall scrappiness. Funny enough, these are all traits we look for in our franchise partners! We are thrilled to continue our westward expansion with T.J. on our team...a true ambassador to eating healthy and living well." Currently the reigning Bantamweight champion, Dillashaw has appeared on many mainstream outlets such as the Joe Rogan Experience podcast sharing his passion for juicing and eating healthy to prepare for his training and fighting schedule. "I juice like crazy and sometimes, with my training schedule, it's hard to do it myself. So, it just made sense to be a part of a franchise organization that I 100% believe in and support," said Dillashaw, who resides and trains in Southern California. Clean Juice continues its rapid ascension as the country's first and only USDA-certified organic juice bar after recently announcing the opening of its 50th store in East Nashville, Tennessee earlier this year. The company has another 70 stores in development and expects to exit 2019 with more than 100 stores operating. If you are a member of Clean Juice you may be interested in learning how to optimize your content on our network.